Colorado Parks and Wildlife with the U.S. Forest Service and Rocky Mountain Flycasters help put together an amazing fishing opportunity for the whole family on Colorado Free Fishing Day. Register your children to fish West Lake at Redfeather Lakes with the help of USFS, CPW, and RMF. Space is limited so families should register soon with Colorado Parks and Wildlife. An online link will be available soon . RMF volunteers are needed to help with youngsters fishing with spinning rods, contact Lee Evans or sign up through our Volunteer database. Fish a Private Red Feather Lake. Get in on some limited access private lake fishing in the Red Feather Lakes area. Just four seats available. Contact host Bob Green. Members on the trailRocky Mountain Flycasters has partnered with the City of Fort Collins Natural Area Department to perform trail maintenance at Gateway Natural Area. 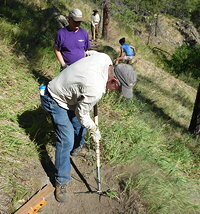 We will conduct trail maintenance, such as grading, pruning brush, and rebuilding portions of the two overlook trails. We will meet at the Gateway parking lot located back by the old water plant at 8:30 a.m. and work until about 11:30. You will not need to pay the entrance fee because you are on the work project. Just tell the entrance guard you are with Rocky Mountain Flycasters. RMF-TU will provide lunch and the Natural Areas Staff will provide assignments, tools, water and instruction. Bring work gloves, sun protection, and your rod and waders for fishing later. You are free to stay at Gateway after the work project and fish til dusk. Please contact Dave Morse, or call 217-418-9386, if you will be coming. We need an accurate head count to plan for meals. We are hoping for a dozen folks. See you there! June 12: RMF Board Meeting at 7:00 PM. Members are welcome to attend any board meeting. Check with a Board Member for the meeting location and/or agenda. Hike in to a crystal clear alpine lake to find some lovely cutthroats in the morning. In the afternoon, drop down to Joe Wright Reservoir for grayling. Contact Dave Morse to join in. Download this month’s calendar entries for your digital calendar. It’s easy today to learn to fly fish. Women are being welcomed and encouraged to join Trout Unlimited and Federation of Fly Fishers chapters and other fishing clubs. Beck, Cathy, 2002, Fly Fishing Handbook. (Guilford, CT: The Lyons Press), p.2. For water conditions in our area, please check U.S. Geological Survey’s Real-time water data.